When the community asks, we give. 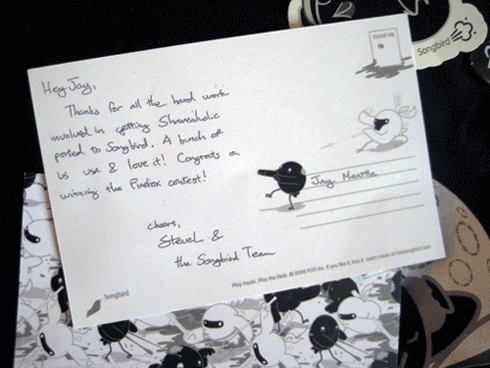 So we went to work, and we’re pleased to announce that Shareaholic now fully supports Songbird! What is Songbird?Songbird is a desktop media player mashed-up with the Web. Songbird is committed to playing the music you want, from the sites you want, on the devices you want, challenging the conventions of discovery, purchase, consumption and organization of music on the Internet. Songbird is a player and a platform. 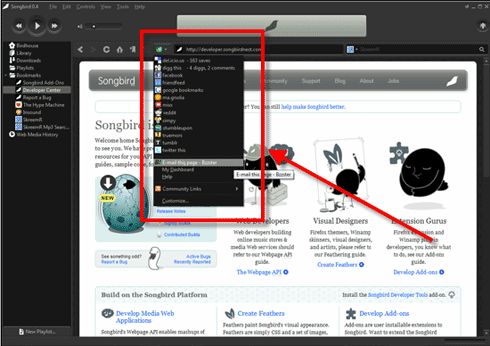 Like Firefox, Songbird is an open source, Open Web project built on the Mozilla platform. Songbird provides a public playground for Web media mash-ups by providing developers with both desktop and Web APIs, developer resources and fostering Open Web media standards, to wit, an Open Media Web. A big thank you to Stephen Lau, the Developer Advocate at Songbird! He was always there to answer questions, and made the entire process dead simple.